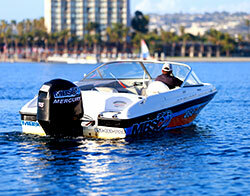 Rent one of our powerboats for an exciting day of high speed cruising in Mission Bay! 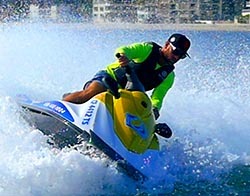 We also offer water skiing and wakeboarding equipment for an additional rental fee. Maximize your skiing time by hiring one of our experienced captains! Just inquire in advance to schedule. Our pontoon boat rentals are hands down the best way to get out on the water with a group of friends or family to enjoy everything that makes San Diego the ultimate water sports destination. 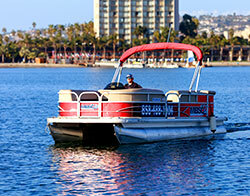 Cruise the beautiful waters of Mission Bay, and enjoy some time on the water together! A unique and exciting boat rental offering, the CraigCat is a high speed, high adrenaline experience that always draws attention. 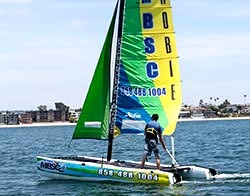 With its catamaran style design, it can carry one or two people and can reach speeds of up to 30mph. The Catalina 14.2 is a great sailboat to learn in, but experienced skippers will also appreciate the performance that it has to offer. An ideal rental for a sailing family or couple. 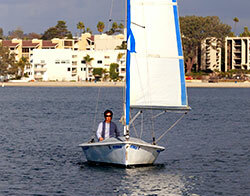 Bigger and roomier than the Catalina 14.2, this sailboat better suits groups or families of 4 to 6. 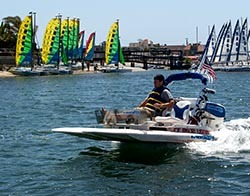 The bigger cockpit makes for a more comfortable outing, so that the whole family can enjoy an unforgettable day on the waters of Mission Bay. Our largest sailboat available, these boats will carry up to 8 people. They are known for excellent performance in nearly all conditions, and make for a safe, comfortable ride on the waters of Mission Bay. 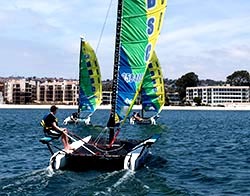 Quick and nimble, these catamarans are a blast! 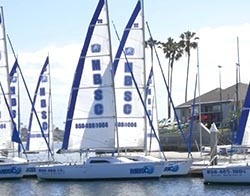 Take one out solo, or bring a friend to discover just how fun sailing a small catamaran on Mission Bay can be! Bring the whole family on this large and stable catamaran! Sporting a huge carrying capacity, this boat will comfortably accommodate 6 adults. 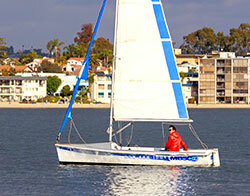 Or take the whole family out for an unforgettable evening cruise on Mission Bay. 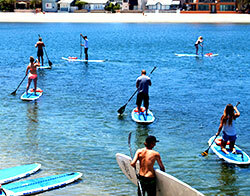 One of the most popular activities in Mission Bay is stand up paddleboarding (SUP), due to the calm waters and pure fun! Because paddleboarding is much easier to learn than surfing, this is a popular option for people of all experience levels. Easy to master, but don’t be surprised if you take a swim or two! 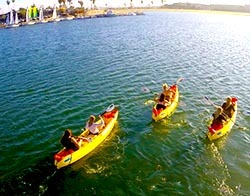 A kayak rental is a great option for people of all experience levels who want to spend an hour or two (or more!) out on the water. Perhaps our most user friendly option, our kayaks are stable, safe, and easy to use. A great option for a relaxing, slow paced day on the water. 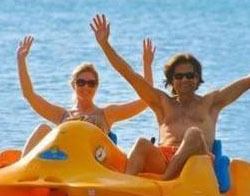 If you can ride a bike, you can ride a pedal boat! Easily steered with a centrally located steering lever, and propelled by a pedal powered wheel. One of our most user friendly boat rentals.